My first experience with the Sisters of Mt. Carmel occurred September 6, 1958, the day I entered the convent to become a postulant. My first experience with the charism of Carmel occurred about 14 years before that, when my family moved from Pennsylvania to make their home in southern California. It was there that I was introduced to Carmelite spirituality since the parish that my family moved to was staffed by Carmelite Friars. Growing up in a Carmelite parish gave me an incentive to join a religious community that was also Carmelite in spirit. 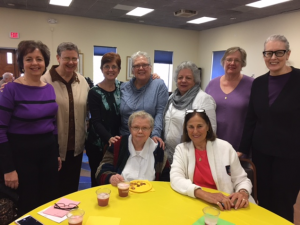 My selection (and my call) sent me to Louisiana to join the Sisters of Our Lady of Mt. Carmel. Since I can remember, I always felt a vocation to become a Sister, but I felt so “attached” to the spirit of my home parish that I wanted to find a group of Sisters who were also Carmelite and whose ministry included teaching. Through my years of teaching and my many years of school administration, I have had the opportunity to share the special charism of the Congregation – indirectly at first – in the ministry of service. It was not until my ministry involved leadership as a religion coordinator and then as a school principal that I felt I could (and did) become more directly involved in sharing that part of our charism involving one’s prayer life. Through staff meetings for instruction, and our monthly gatherings to pray, I feel those adults who worked with me in the area of education learned something of the importance of prayer in one’s daily life, and in turn, were passing on this value to those they met in their daily classroom adventures. Sister Mary Martin’s retirement party. When I was invited to join the staff at the national Lay Carmelite Office in 2002, in Illinois, passing on our Congregation’s orientation to a life of prayer and service in union with Jesus became a very direct ministry. 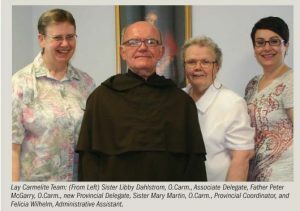 As Coordinator of the Lay Carmelites in the province of Most Pure Heart of Mary, my ministry involved both education in what it means to follow The Carmelite Way, as well as how one lives out the Carmelite call to prayer, community, and service. Now in my retirement (March, 2017) I continue to volunteer once a week at the LC Office mostly working with records, but also in any way I am needed. At home, I am blessed to be abled to devote more time to quiet and contemplative living, both of which, I feel, continue to impact those I have ministered to in the past as well as those presently in my life and in our world. It’s been a good life so far – very, very challenging. I feel called in these senior years to continue the challenge any way I can, for the rest of my days!